Given that "Motor" is their middle name, it's no surprise that engine details are taken very seriously at BMW. 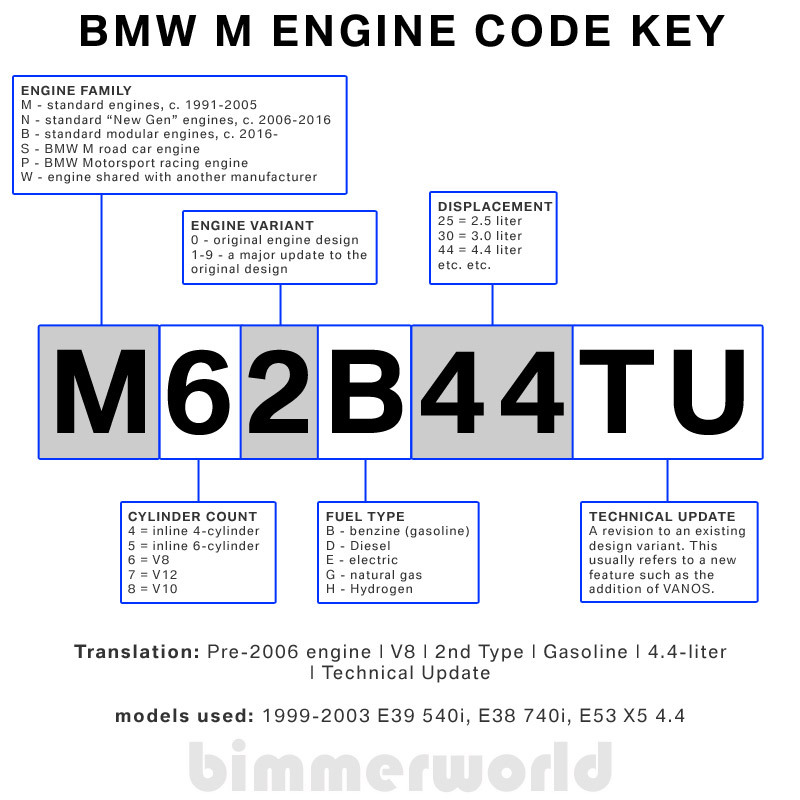 And for BMW fans and geeks like myself, the BMW engine type codes are chock full of interesting details and information. 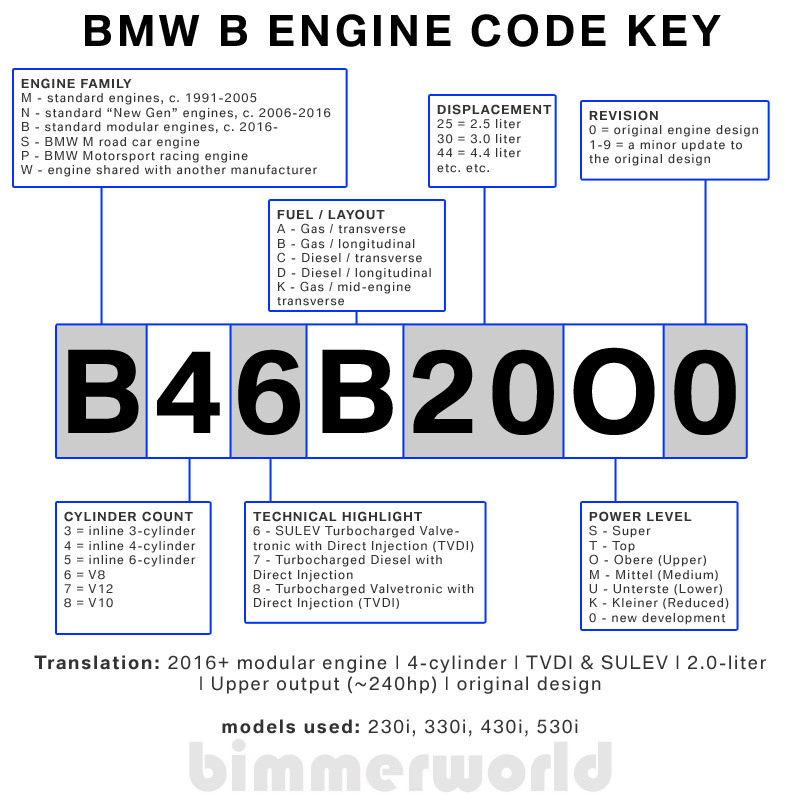 The BMW engine codes are alphanumeric and contain information on the type, layout, size, and technology. This can be very confusing when shopping for parts but also immensely helpful when distinguishing between similar models (2005 530i vs 2006 530i, for instance). BMW engines evolve from one generation to the next but generally derive from one original design. For example, the inline-6 cylinder engines in the E34, E36, E39, E46, E53, Z3 and Z4 can all trace their origin to the M50 introduced in 1991. With revisions and updates over the years it's unlikely that parts will simply interchange so knowing the specific engine type can be very helpful when sourcing parts. The German translation for engine is "motor" so it's no surprise that the engine codes begin with "M". But unfortunately this can be confused with BMW Motorsport models. When talking about BMW "M engine codes" we mean the standard production models, not Motorsport models. The Motorsport cars receive "S" engine codes. And official race cars get "P" codes. BMW ran out of M codes in the late 1990s and began planning N engines (also referred to as New Generation). And in the mid-2010s they shifted gears again and introduced B-series codes for their modular engines. 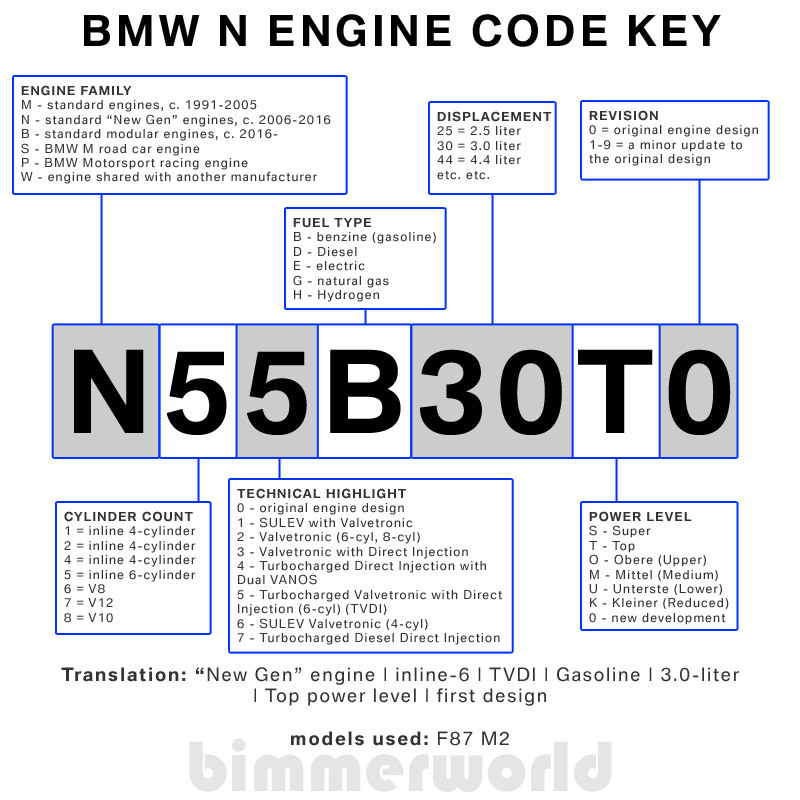 Below you will find very detailed information on BMW engines and how to decipher the engine codes. It's a very comprehensive list but not a complete list. While other pages, including some that I myself created, focus on US engines I will try to include as many European and other variations here (as well as I can). Also listed are Motorsport S engines and race P engine details. M49 3.5 I6 24 DOHC 430+ 310+ 1974-1976 3.5 CSL BMW Motorsport and Schnitzer developed engine for IMSA and Le Mans. Loosely based on M12/7 race engine. Beginning in the early-2000s, BMW revised their naming strategy to get more info out of each character and make it easier to understand updates and revisions. The new BMW engine designs were ground-up fresh designs with groundbreaking advancements in materials and technology. Turbocharging and Diesel engines were also introduced to the US market so BMW had to be more specific in their engine coding. For the 2014 model year BMW began introducing a new modular engine family. The first cars to receive the new "B series" engines were the i8 hybrid sports car and the Mini model range. Both of these cars shared a 3-cylinder turbocharged direct injection with Valvetronic. The modular engine family uses gasoline and diesel engines that share common components and architecture. 60% of the gasoline engine parts are shared among multiple size and cylinder counts (the 3-cylinder shares many of its components with the 4 and 6-cylinder engines). Engine size and layout jumps in 500cc increments - 1.5L I3, 2.0L I4, 2.5L I6, 3.0L I6, etc.